Rubber-Cal's Eco-Sport interlocking rubber tiles are a recycled rubber floor that are 3/4-inch thick and available in 4 aesthetically pleasing colors, Coal, Blue, Green, and Terra Cotta. 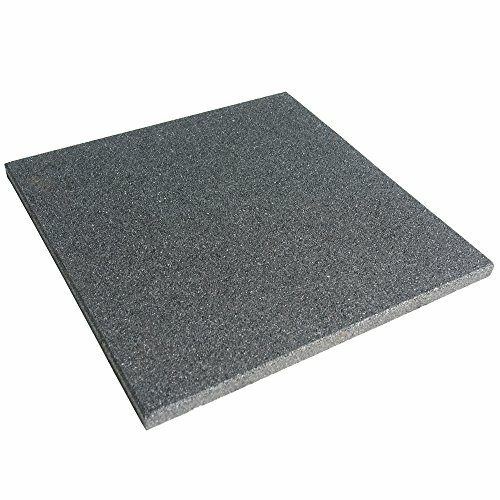 with their 3/4-inch gauge, these rubber flooring tiles are designed to withstand the abusive conditions there are ideal as equipment and ground protection mats. Gym floors are an area that experience lots of foot-traffic, dropped weights, excessive moisture, and are burdened with very heavy equipment. The Eco-Sport excels in this environment. These heavy-duty mats are un-phased by moisture or water and the 3/4'' thick rubber mat is ample defense against dropped barbells or weighty fitness machines. This recycled rubber floor is also an excellent for either outdoor applications due the high contents of high quality recycled tire rubber used in their production. Tires are made to be driven on asphalt rain or shine for thousand of miles The Eco-Sport tiles exhibit a similar endurance when used as an outdoor floor. Recycled rubber is also a superior material when trying to reduce noise, contain vibration, and absorb shock. These products are specifically manufactured for durability and are designed for either residential or commercial applications that are require ground protection mats. If you are concerned about installation, we have made it easy for you This product offers an interlocking mechanism, a plastic connector pin, which is connected between two tiles. Each square tile has two holes on each of the four sides. The connector pins are made of hard plastic with ferruled edges that holds them in place inside the tile once they have been inserted. This is an easy do it yourself flooring installation that can be done by anyone Use these heavy-duty mats on gym floors, as floor for basement, outdoor floor tiles for a patio, or floor for garage ''Man Caves''.